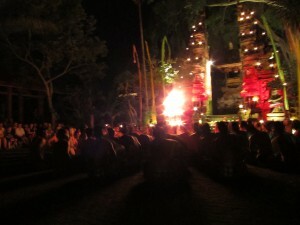 Last night we went to a traditional kachuck performance in Ubud, Bali. It was almost hypnotic with the hundred-odd men performing in unison with the errie but beautiful backdrop of Hindu temples behind them. Sadly, it was also horrible conditions for pictures, so no gems to share. The next day, our last in Bali before heading to Jakarta, we were zipping around town on the moped that Josh is now a pro at driving. 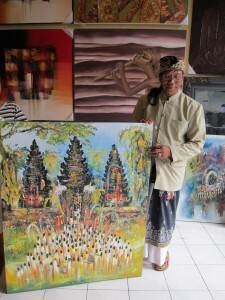 We stopped short when we saw a painting displayed on the street that reminded us of the night before. A lot of haggling, a little rolling, and now it’s ours! The first piece of art that we’ve bought as a married couple. I feel so grown up. Scene from the kachuck performance.